Most of us are familiar with the phrase “the cover-up is worse than the crime.” It was probably first in the Watergate years that this became a popular saying. It was bad enough that the initial crime was committed, but the cover-up just made everything bigger and created more guilt than the initial act. But whether it’s with political leaders in government or in the church, whether it's sports figures or celebrities, the natural tendency is to try to conceal and paper over and even justify unethical behavior or sins or crimes. People fear that too much will be lost if they are simply honest about things. Their enemies will gain too much of an advantage. Trying to cover up sin is usually worse than the sin itself. For then it’s not just that we’re sinning, but we’re embracing and holding on to our sin, holding it outside of and away from God’s mercy, rejecting God’s Word in unrepentance and unbelief. Then we’re engaged in the futile attempt to justify ourselves when only God can justify us. We’re afraid to be honest about things because we think we’re going to lose in the process or give our adversary the advantage. But the only thing we truly have to lose is our guilt. And the only way our adversary, the devil, truly gains the advantage over us is if we deceive ourselves with excuses and rationalizations. Our Lord Jesus is saying to the lawyer and to all of us today, “Repent. You are the man laying on the side of the road. You are the one who has been robbed of the glory in which you were created. Sin and Satan and world have beaten you and left you in the ditch, physically alive, but spiritually dead. The Law cannot save you. True, it can diagnose your condition, but it offers you no medicine. Like the priest and the Levite, it passes by on the other side. Only I, Jesus, your Good Samaritan can rescue you. I have come to you as a foreigner from the outside, the Son of God from heaven. Though I am despised and rejected by the Jewish leaders as if I were a Samaritan, I have come to show you mercy and compassion. 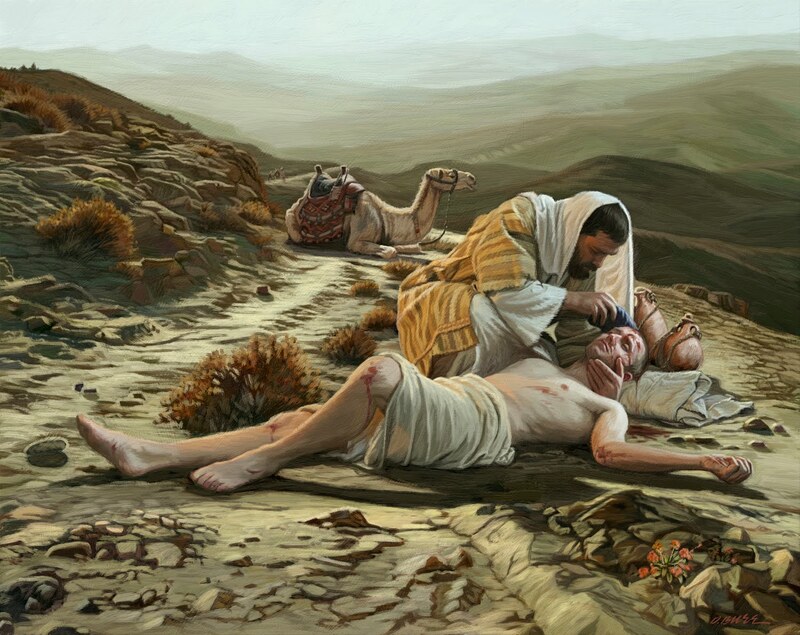 The Good Samaritan Jesus comes to you and He cleans up the wounds of your sin in the waters of baptism. He pours on the oil of His Holy Spirit to comfort you and the wine of His blood to cleanse and purify you in Holy Communion. He gives you lodging in the Inn which is His holy church. Here you are continually cared for through the preaching of His words of life. For although your sins are fully forgiven, yet the wounds of sin are not fully healed. We still live with their effects in this world, don’t we. The Church is the hospital where those wounds are tended to by the Great Physician, lest they become infected. The innkeeper is the pastor; Jesus provides me with two denarii, so that the Lord’s overflowing compassion might continue to be given to you in His ongoing ministry of the Gospel. Jesus promises to pay whatever it takes to restore you. For in fact He has already paid the full price, fully justifying you by His sacrifice on the cross. Repenting and believing in Jesus, He now lives in you and through you to love and be the neighbor to others. He frees you to “go and do likewise”–not because you have to in order to be saved, but simply because your neighbor needs you. Since Christ became weak for us and bore all our infirmities and sorrows, we learn to see Him in those who are weak and suffering. We show love for Him by loving them. And even if our neighbor is not deserving, we remember the Scripture which says, “Love covers a multitude of sins.” That is precisely what the Lord has done for us. You are indeed blessed in Christ by His covering of your sins with His forgiveness. Through Him the promised inheritance is yours, a free gift, won by His death, delivered by water and the Word, sealed by His body and blood. As you rest and recover here in the Inn, be strengthened in the certainty that very soon your Good Samaritan will return to you as He has promised. The risen Jesus will come again, your compassionate Lord, and you will be with Him in the perfect rest and contentment of the new creation in the life of the world to come.